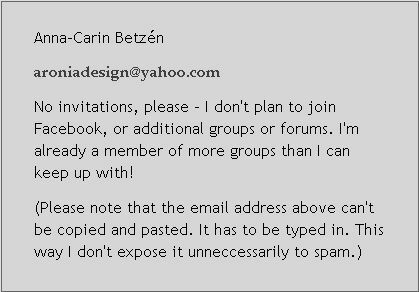 My sister, nicknamed "the dragon" due to her hot childhood temper, spent the year 2000 in South Africa. A Swedish family spent that year in Hout Bay, near Cape Town, and needed a nanny for their retarded son. My husband and I visited her once during that year, so I knew it was a spectacular country. When I found some small plastic dragons at the hobby shop, I decided to build her a dragon roombox as a memory of her year abroad. 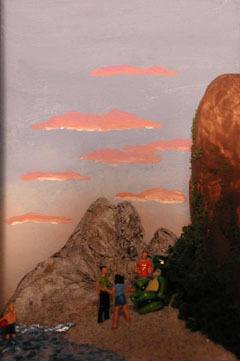 The dragons were a suitable size to combine with N scale (1:160) model railroad people, so the scale of the scenes is approximately 1:160. 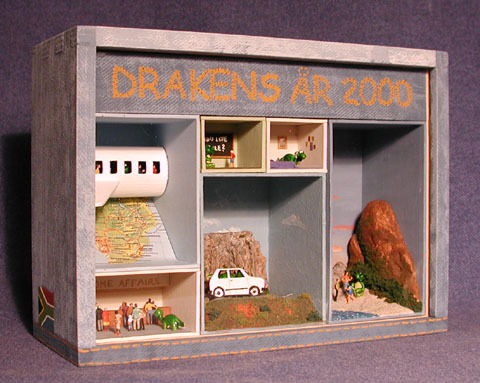 When I found out that 2000 was the year of the dragon according to the Chinese calendar, I decided to incorporate a text at the top, saying "Drakens år 2000", i.e., "The Year of the Dragon, 2000". The glass-front, back-opening roombox housing all the scenes is one that Ikea carried in the past. I finished the exterior in denim style, as she likes denim. I first painted the surface light blue (FolkArt's 964 Midnight mixed with white), then used a darker blue (same color mix with less white) to "print" the fabric pattern using a scrap of denim. I did one side of the box at a time, using different shades of blue for a varied look. The seams and text were done in ochre (FolkArt's 917 Yellow Ochre) with a fine brush. 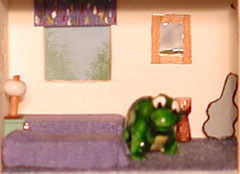 The individual roomboxes are all removable. 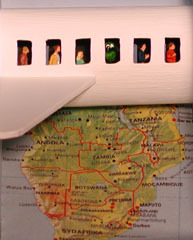 The first box shows the trip down - an airplane over a map of the African continent. The 2nd box, which I don't have a close-up of, is from Home Affairs, where she had to go many times in order to secure her visa for the entire year. She was teaching her protégé in the family's home, and he made great progress. He learned quite a bit of English during that year, and kept practising whenever he got a chance. 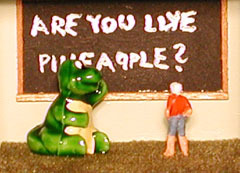 During our visit we noticed that he kept mixing up the phrases "do you" and "are you" - hence he asked us whether we were like cars, and whether we were like pineapples. This is the dragon's room. There were twin beds, but she didn't have to share the room with anyone. She brought the guitar in its case from Sweden and back. The mirror and drum were bought in South Africa, and we brought the drum home for her when we left. She bought a used car so she'd have a greater freedom of movement. Here she's heading up Signal Hill outside Cape Town, with Table Mountain in the background. The car is a free paper model I found somewhere on the internet and scaled to fit the dragon and her passenger. Watching the sunset at the beach of Llandudno was a favorite of my sister and her local friends. I used dimensional fabric paint for the water. 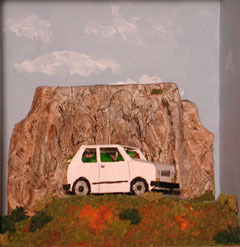 The rocks are all paperclay, and so is Table Mountain in the pic above.